In the 2016 Democratic primary, Hillary Clinton mopped the floor with Bernie Sanders among black voters. That a commanding 50-point margin separated the two with this crucial cohort prompted soul-searching for the Vermont senator, whose 2020 plans rest on building a more multiracial coalition. Sanders has responded with earnest outreach. He has communicated frequently with progressive black mayors across the South and endorsed popular black statewide candidates, like Andrew Gillum and Stacey Abrams. The Associated Press reports the senator “huddles more routinely with black lawmakers to discuss shared priorities.” And Sanders continues to downplay his 2016 black support gap, pointing out that he won voters under 30 across racial lines. In neither statement did Sanders indict voters for backing racist candidates. To the Daily Beast, he recast their racism as mere discomfort, and to NPR, blamed a candidate-led con job and not the electorate itself. That he did this may have been a rhetorical lapse, or strategic to his political aspirations — calling racist white people “racist” is a good way to ensure they do not vote for you. But either way it is not the truth, and echoes a broader tendency in American politics to entice such voters by lying to them about how racist they actually are. Sanders is far from alone in failing to upbraid bigots, but he is singular among white progressives being floated as 2020 hopefuls. He is the most popular political figure in America, according to multiple polls. 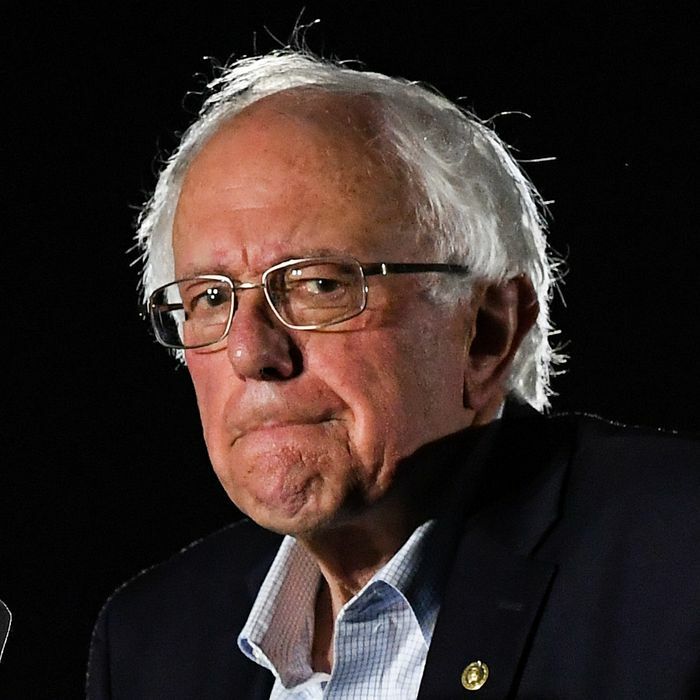 He has almost single-handedly driven the Democratic Party’s leftward shift on policy, giving him significant sway over whatever platform future candidates put forth. Such influence has likely engendered caution. Sanders saw what happened to Hillary Clinton when she told the truth. In September 2016, the then-Democratic presidential nominee made a speech decrying “half of [Donald] Trump’s supporters” as “deplorables” — “racist, sexist, homophobic, xenophobic, Islamaphobic.” She was not being derogatory. Clinton’s claims were borne out by several polls attesting to the bigotry infecting Trump’s coalition. But looking back, even she sees her honesty as a gaffe. “I’m sorry I gave [Trump] a political gift of any kind, but I don’t think that was determinative,” Clinton said last year. The term “deplorable” has since assumed totemic power among the president’s base, adorning T-shirts worn proudly by those Clinton described as such. The costs of such language now loom large over Democrats’ 2020 ambitions. Soon after the 2016 election, Sanders spoke critically about the limits of appealing to voters on the basis of identity alone — a thinly veiled critique of Clinton’s rhetoric. “It’s not good enough for someone to say, ‘I’m a woman! Vote for me!’ ” he said. “What we need is a woman who has the guts to stand up to Wall Street, to the insurance companies, to the drug companies, to the fossil fuel industry.” Yet this is not true on the other side. 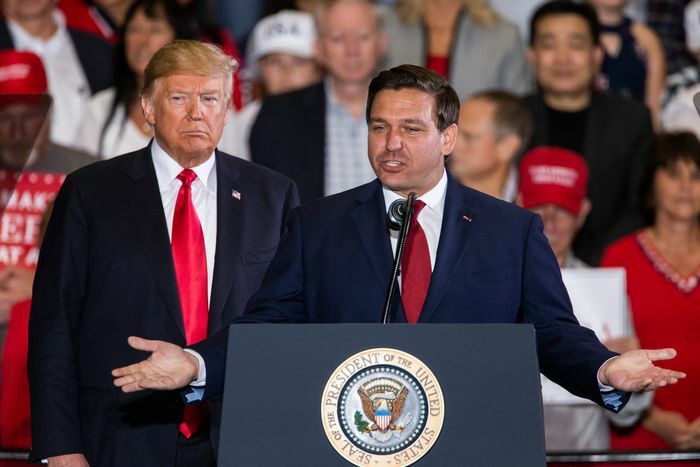 Appeals to identity did not hamstring Trump en route to victory, or Ron DeSantis on Tuesday. On the contrary, Trump’s rhetoric was practically a who’s who of white grievance causes. DeSantis, Gillum’s Republican opponent in the Florida governor’s race, used Trump’s formula to sweep the board with white voters, garnering 51 percent of the white female vote and 79 percent of the white male vote, according to CNN exit polls. This was despite the Republican lacking so much as a concrete political platform as late as September. The essence of his appeal was less policy than it was racism. Sanders likely used a similar calculus, albeit weighted by less political risk due to his whiteness. Both men understand that racist whites are a significant voting bloc, and winning governorships and presidencies must at the very least account for them. But it is a tradeoff. Unwillingness to alienate racist voters inevitably leads to coddling racist voters. Whether everyone who voted for DeSantis fits this descriptor is up for debate. Whether the parameters Sanders outlined in his initial statement does — voting against a black candidate because of some race-based “discomfort” with said candidate — is not. Sanders is describing racism without naming it, even as he seems willing to indict the candidates for reaping its rewards. That it’s not politically expedient to have such a conversation honestly — especially if one sees the alternative as gift-wrapping American democracy for Trumpian grifters, kleptocrats, and white supremacists — is one of the more pathological features of today’s politics. But how sturdy, really, is a democracy kept afloat by lies? We are quickly learning the answer.